I'm staring at this page right now and I have nothing. I think for once in my life I have learned to clear my mind. That is not very useful as a writer in this moment but I'll take it as it comes. To not think is so much harder than to think. Usually I have ten million thoughts running through my head but not today. There's only chocolate on my mind and I'm going to let it play out. If I give in to my chocolate thoughts then that leaves me with nothing else but incredibly satisfied taste buds and a clear conscience. It's bittersweet clarity. 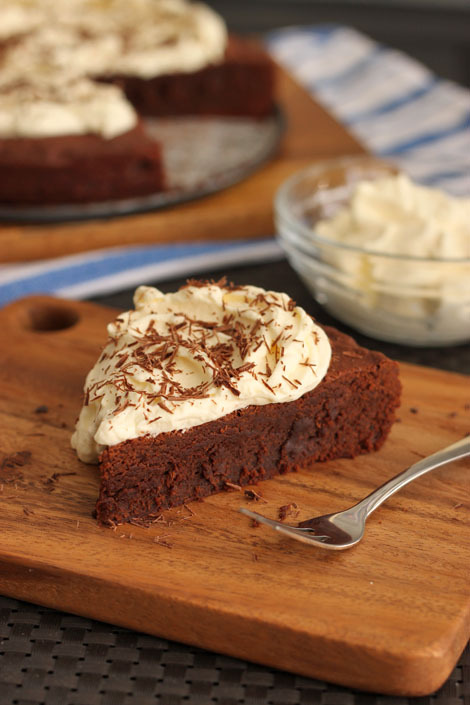 My recipe today is a soft, fudgy, almost-a-brownie-but not-quite-a-cake cake. At first glance it looks like a brownie but when you get down to the method you start thinking "cake". You'd be right either way because this dessert sits right on the edge of both definitions. Chocolate with at least 70% cocoa solids is crucial. 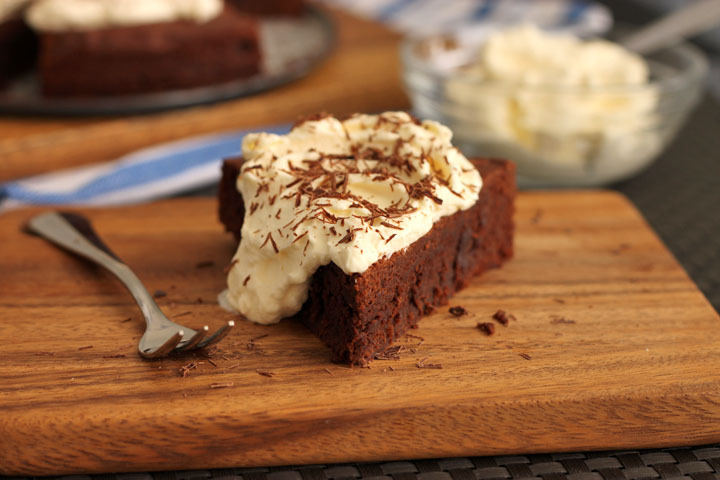 Other chocolate will carry more sugar into the recipe and make it too dense - more like a brownie. Now on to creaming. Butter and sugar get light and fluffy. You know the drill. Eggs and vanilla up next. It feels like cake again. Two tablespoons of coffee add a hint of bitterness and this addition of liquid adds just a touch of softness to move the recipe away from being a dense brownie. After we mix in the melted chocolate we stir through a sifted combo of flour and cocoa. It needs about 25 minutes in a moderate oven to stay soft and moist. The whipped cream is necessary. It will just haunt you all day if you don't. Permission to stop thinking and just eat this hunk of chocolate. Amen! Preheat oven to 350 degrees F. Spray an 8 inch round springform pan with non stick cooking spray and line the bottom with parchment paper. Set aside. In a small cup mix together the warm water with the instant espresso powder, set aside. In a large bowl whisk together the sugar and butter until fluffy. Add the eggs, vanilla extract and espresso mixture. Beat until all is combined. Add the melted chocolate and stir it through. Sift flour and cocoa over the bowl and fold it in gently until it’s incorporated but don’t over mix. Pour batter into your prepared pan and bake for about 25 minutes or until when a toothpick inserted in the middle comes out with moist crumbs but not wet batter. Cool for about 5 minutes in the pan and then transfer them to a cooling rack to cool completely. 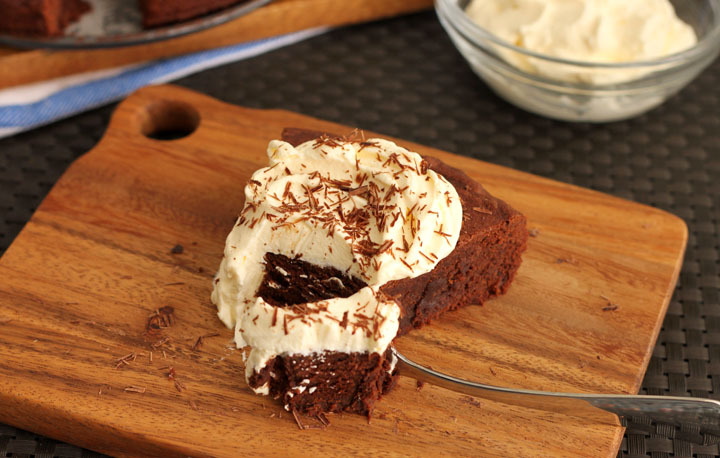 Whip cream to soft peaks and slather over cooled cake. Decorate with chocolate shavings. The beauty of life is always related to food preparation and tasty food eating. But when we choose different food items there some faults too. One of that is "opposite food items" so be understand about that too from an experts. You provide a plenty of recipes on a daily basis! How come? Are you a professional cook? Have you got any qualifications? If so, our resume writing service will be more than glad to supply you with a 100% job-winning resume! Hi there, do you recommend 60% chocolate for this one, or 70%? Would love to try it. Perfect - thanks so much! 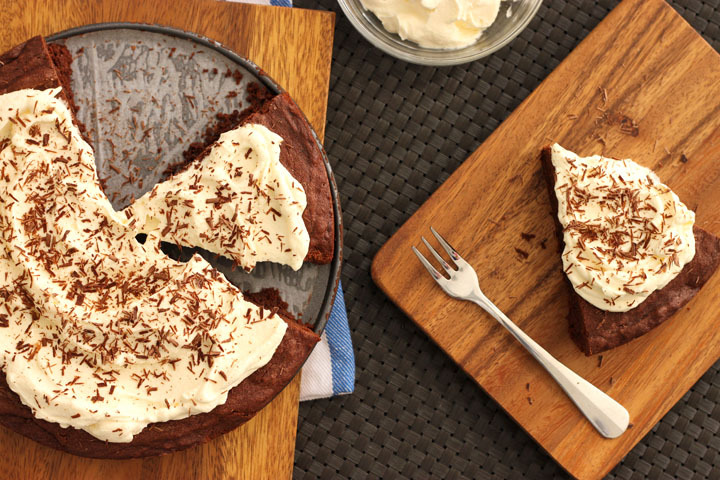 :) I made both the dark chocolate and sour cream chocolate cakes recently and they are just lovely.